I have enabled SPI on my Raspberry Pi 3, and want to know why the mode for physical pins 24 and 26 are set to Mode 'OUT' and not 'ALT0'. According to the documentation here and here the mode of all of these pins should be 'ALT0'. So what is the deal? Here is a screen shot when I execute 'gpio readall' from the commandline. If I execute the command 'gpio mode 10 alt0' it does change the mode of physical pin 24 to 'ALT0', but when I reboot, or cycle power (after a graceful shut down), the mode changes back to 'OUT'. It depends on whether the SPI software driver you are using is setting the slave selects (CE0/CE1) itself or if it is letting the SPI hardware set the slave selects. If the SPI hardware is setting the selects those GPIO need to be in mode ALT0. If the SPI software driver is setting the selects those GPIO need to be in mode OUTPUT. The original Pi SPI software driver let the SPI hardware set the selects (so they were ALT0). 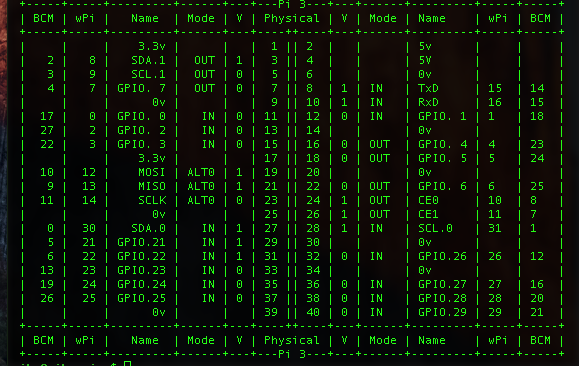 The current Pi SPI software driver sets the selects itself (so they are OUTPUT). The principal reason is so that the current driver can support more slave selects than the hardware. Not the answer you're looking for? Browse other questions tagged pi-3 gpio spi or ask your own question. Can header pin 11 be used as GPIO17 in Windows 10 IoT? In simultaneous use of SPI0 and DPI Mode 3 interfaces, can SPI0 CS0 be moved to a pin other than 8? Why Raspbian jessie version 8 won't allow communication through GPIO serial pins?